Well, to wrap up our series 'Desserts for Fall', I've decided to go ahead and send you off with not one but two fun & delightful dessert ideas to really make your loved ones thankful next week. Nothing turns the 'ho-hum' holiday between Halloween and Christmas (or whatever big day you celebrate around the end of the year) like a plate of creatively clever desserts! 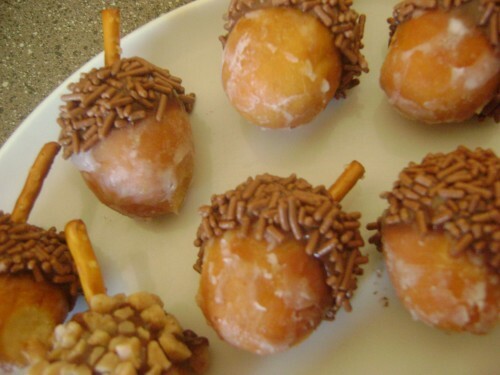 First off, check out these fantastic 'Acorn Donut Holes' from Gracious Rain. The perfect little biteful for a pre-Thanksgiving dinner snack or just something to have in the kitchen for the days leading up to big feast. And if you happen to have a donut hole maker, than you are halfway there already. Take a peek. 1.) Spoon out Nutella, sprinkles, toffee crumbles, and pretzel sticks into four separate bowls. 2.) 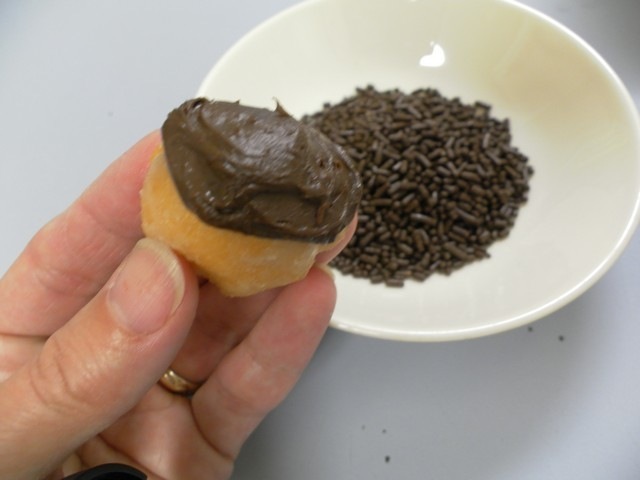 Dip the top 1/3 of the donut hole into the Nutella, then choose either the toffee crumbles or the sprinkles and dip the Nutella covered area of the donut hole into those. 3.) Insert a pretzel stick in the top, center of the donut hole . . . this will be your acorn stem! Place on a lovely serving tray and there you go! Why not cut some leaf shapes out of Autumn-hued napkins if you are feeling particularly crafty? Or go on ahead and make a quick stop at Dunkin' Donuts; I'll never tell:) And how about these sweet little treats from Totally Cookies . . .
1) Heat the oven to 180 degrees Celsius. 2) Cream the butter and sugar in a large bowl. 3) Add the egg and vanilla extract and mix well. 4) Combine the flour, baking powder, and salt. 5) Chill the dough for several hours or overnight. 6) Divide the dough into 3 parts. 7) Roll the dough out on a floured surface. 8) Using a knife cut out corncob shapes about 4 inches long. 9) Place the cookies on ungreased baking sheets and bake for 9 minutes. 10) Let the cookies cool then transfer them to a wired rack. 11) Frost the cookies with the vanilla frosting. 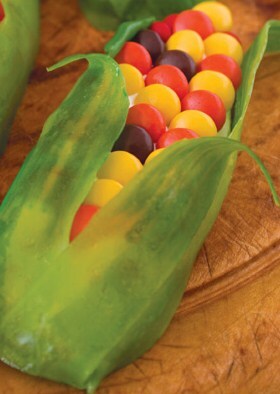 12) Use scissors to husk from the green stretch candy and press the husks in place. 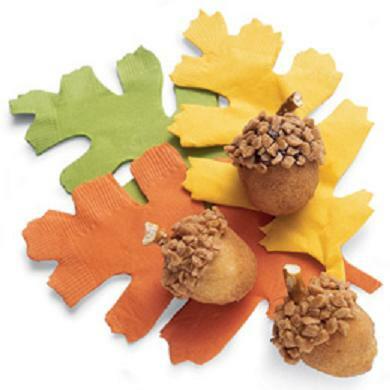 13) Fill in the middle with candy kernels. Loving those two simple recipes, sure to bring smiles to everyone at your Thanksgiving table! Well, that does it for our 'Desserts for Fall' series. I can't believe we are almost onto winter already; my how time flies!! Have a fun weekend, everyone!